I'm inching my way up the large scale ladder. I've been dancing around the idea of doing a big pool ball painting for a while now, and at 24 x 24, I believe this one fits the bill. I get requests, on occasion, to include some in progress images of a painting. Since this particular piece will probably take some time, I thought it would be a good one to use for that purpose. The image above shows the painting at the completion of the first pass. I'll post more images as I conclude successive passes. I mentioned in a previous post that I had done some bartering with my nephew/dentist for some dental work. This is my half of the bargain. Jason, and his partners are in the process of moving into their new office (a very impressive space) and he asked for one of my reflective percolators to hang above the coffee station that will be included in the waiting area. I completed it a few days ago, and will be sending him an image of it today. Hope he likes it. 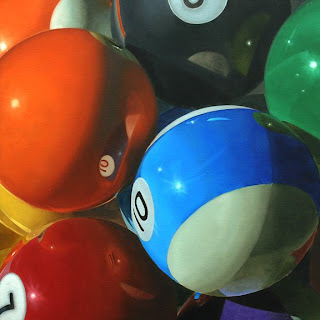 After I completed the painting above, I began a really big (really big for me) pool ball painting. The dimensions of the canvas are 24 x 24. Each of the balls is about 14 inches in diameter. It's a strange experience, painting them that size. Essentially six times larger than my traditional compositions. I have to say, it looks kind of cool. Karen really loves it. It will take some time to complete, so I'll be putting up some "in progress" images. I'll post the first image tomorrow. Finally finished up the most recent PB&J. It's a little bigger than I usually go with bread, and sandwiches, but I think it still works pretty well. 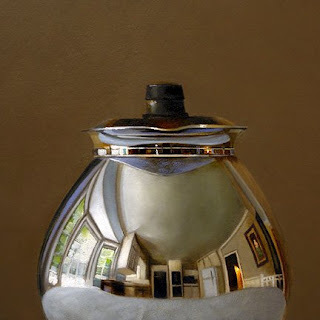 This is slated for a show in the fall at Anne Irwin Fine Art. Now, I'm finishing up my "bartered" piece, for our nephews new dental office. We delivered Karen's piece to the new office yesterday, and everyone was thrilled with it. I think it will definitely put the patients at ease, as they await their fates in the outer office. Once my contribution is complete, it's back to work for Wynne/Falconer. 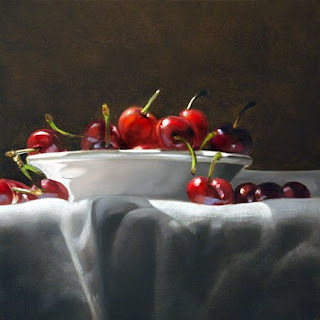 This is a smaller, and subtly altered version of a cherry bowl composition I painted a couple of years ago for my now defunct Atlanta gallery. I always liked this image, and when I saw how much red paint I had left over from my most recent pb&j, I figured that I could use it for a cherry painting. I'll post the image of that pb&j in the next day or two. If you'd like to participate in the auction for this painting, you can bid by clicking here. I have this ongoing quest to paint a simple piece of white porcelain accurately. To reproduce that wonderful milky translucent surface realistically. 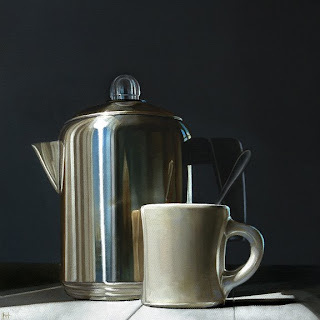 Duane Keiser is great at it, and I hope to one day approach his level of skill. 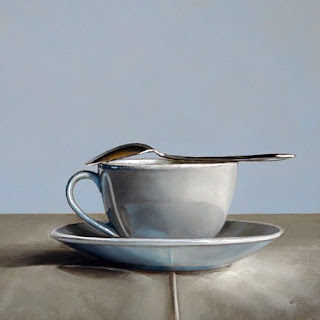 This is a fun challenge, which has resulted in a large number of "cup" paintings, and I feel that I learn a little bit more with each attempt. If you'd like to bid on this painting, you can take part in the auction by clicking here. Of all my percolators, I think this Coffee Master is my favorite. Partly because it was a wedding gift to my parents in the early 50's, and as such inhabits my earliest memories, and partly because of its wonderful shape. The complete coffee maker is composed of two parts, and as yet I haven't painted it in its full configuration. I just love the look of each individual component on its own. Its Tweedle Dee shape, and mirror like surface combine to give you a terrific distortion of the percolators surroundings. One of these days I'm going to buckle down, and put the two pieces together, and paint a large version of the entire appliance. If you'd like to bid on this painting, click here. Viewing Karin Juricks recent set of blog posts, with her paintings of bucolic Lancaster Pennsylvania, and its famous population of Amish residents, got me in the mood to paint some livestock. 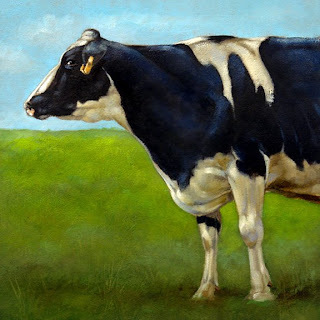 It's no secret that I love painting cows, so I dug into my archive of photos searching for a suitable image. Years ago my dad had arranged for Karen and I to visit the University of Georgia's school of animal husbandry for the soul purpose of photographing their cows. We had a great time that day, just walking around the fields surrounded by these beautiful animals. This image came from that visit. I was specifically looking for a composition that had the cow looking directly at me. I thought this was a good one. If you'd like to bid on this painting you can access the auction by clicking here. My schedule needed some modifying this week. I had been working on a larger piece for Anne Irwin Fine Art, but it needed extra drying time because of the quantity of red in the painting. I decided to get started on a small painting I was planning for my nephew, and now my new dentist, as a trade off for some (beautiful) dental work he had done for me. Karen and I are both contributing art for his groups new office space as payment for dentistry. What a great idea - bartering. Anyway, the first pass on that painting was completed before the AIFA piece was ready, so I figured I'd go ahead, and get busy on some ebay paintings. Karen and I found this little chair in an antique shop here in town, and we both fell in love with its shape and honey colored finish, hence the title. Karen has painted it numerous times. This particular composition was "discovered" as I passed one of the bedrooms at Anna's Veranda, the victorian home we rented at Inlet Beach Florida back in February. The chair had been placed there the day before, and I came across this scene the following morning, just as the sun was clearing the horizon. I grabbed my camera, and started firing off shots. If you'd like to bid on this painting, you can take part in the auction by clicking here. I got an email this morning informing me that my work had been featured on an art blog called PaintBlog. I followed link, and then spent the next hour delving into its' archives. The site is run by Canadian artist Eric Cator. 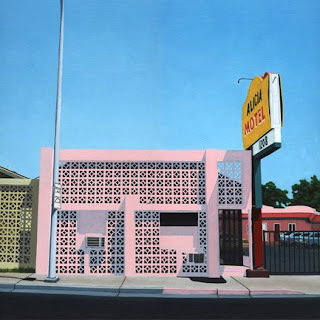 The piece below is one of his urban landscapes titled Alicia Motel. His spartan landscapes, and rooftops are outstanding. His site features a different artist each day. The post contains an image, and a brief subjective bit of text, which also includes links to the featured artist's site, and/or blog. The archives go back to January of 2008, and in the limited time I've spent on the site so far, I've already discovered a number of artists I'm anxious to add to my list. 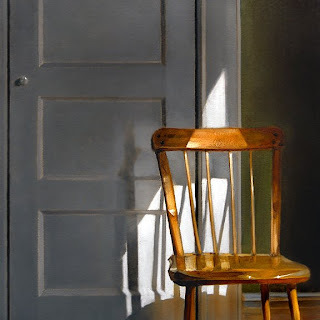 This is a well crafted site, and is a welcome addition to my list of other artists sites, such as Charlie Parker's Lines and Colors, Katherine Tyrrell's Making A Mark, and Artist A Day. 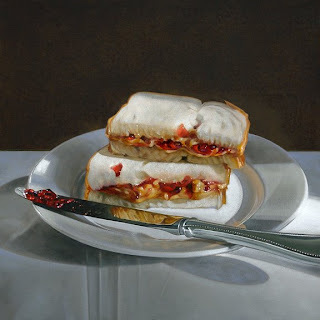 I'm approaching the finish line on the second PB&J slated for the fall show at Anne Irwin Fine Art. It should be complete in the next couple of days. After that I'll be working on another group of six by six ebay pieces, and then back to gallery work. I had so much fun painting this particular piece that I've decided to stay in this vein, and start another. No loaf this time, but continuing with the theme of the pb&j. It's an 18 x 18 focusing on the sandwich. 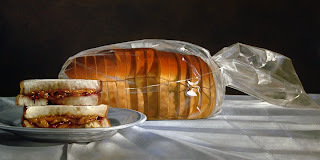 This subject was requested by the owner of the Wynne/Falconer Gallery, and will be shipped up to Cape Cod. The painting I'm working on now will be included in a show scheduled for October at the Anne Irwin Gallery here in Atlanta.